Are you satisfied with your progress at the gym? If you have been training for six months or more, it is time for an upgrade. 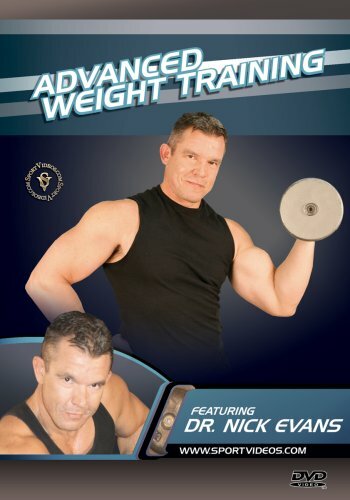 In this program, Dr. Nick Evans demonstrates four different advanced workouts. Each workout targets a different group of muscles. So what is the key to an advanced workout? Intensity! Dr. Evans will demonstrate the ten steps up the ladder of intensity. These steps include: more repetitions, increasing resistance, shorten rest intervals, pre-fatigue the muscle, super sets, drop sets, partial reps, static contraction, negative repetitions and forced repetitions. This DVD can help you to take your training to the next level. About the Coach: Dr. Nick Evans, MD is an orthopaedic surgeon specializing in sports medicine and is a highly regarded authority on weight training and nutrition. He has fostered research in sports injury and has written for numerous scientific publications. A bodybuilder and fitness model, Evans is also the author of two best-selling books. He writes a monthly column for MuscleMag International and is a columnist for Oxygen womens fitness magazine.